Last week was a pretty big deal. It was Claire’s turn to be student of the week in Mrs. Torrez 1st grade classroom. With this designation came a lot of attention and responsibility. Claire got to lead the class in certain lines, do the calendar, put up pictures of herself on the bulletin board that was all about her. She also got to take care of Coco, the class pet. You can see him here helping out at pt. A form was sent home for Claire to fill out all of her favorite things so that the class could get to know her. She had so much fun picking her answers and I was so happy to know that the info that I was sending in really was accurate and not just my well educated guess. Then it came time to figure out the pictures to send in and I was a wreck. I didn’t want to send in too many or not enough and I haven’t seen what any of the other children have done. Claire loves her typical classrooms so much, I didn’t want to embarrass her. As it turns out, it all worked out fine. Claire’s fantastic aide worked with her to choose which ones went up and there was no embarrassment at all. As the week went on I had a nagging feeling that I should take the opportunity to educate the class about rett syndrome. 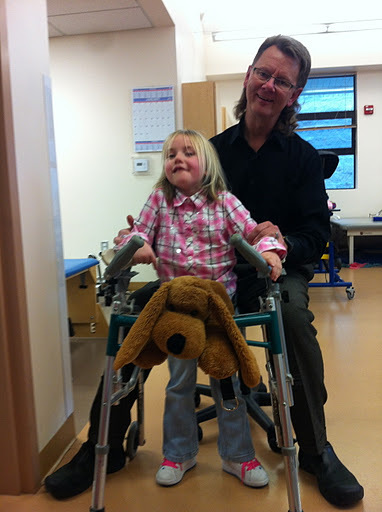 I kept imagining her peers asking their parents questions like; why is she is a wheel chair or why doesn’t Claire talk. Most of them have no clue that she has rett syndrome, more or less what it actually is. How could they possibly answer any sort of question that is sent their way? I emailed the teacher and she said that it would be fine to send a letter home in the Friday folders. I wrote and rewrote the letter several times. Each time there was just something that didn’t feel right. I tried writing it from Claire’s perspective and mine. I wrote one letter with a bunch of FAQs and another with info about the science and how a cure is a real possibility. With each attempt it became clearer that I was not on the right track. Exhausted on Thursday night I broke. I finally broke to the point that I could think straight. These kids didn’t need to learn about rett, they knew about Claire. With that thought I abandon the whole letter idea and went to sleep. As it turns out, I am so glad that I did! Part of the student of the week process is that on Friday, the whole class takes turns and everyone says what they like about the student of the week. WIth no help from me or a letter sent home, each of the children were able to say what they liked about Claire. The boost that it gave her was amazing. When I picked her up that day she was all smiles and so very content. Again she teaches me, just like she teaches others. You don’t have to know all of the facts about rett syndrome if you take the time to know Claire, you will know enough.